Clean squids by pulling out the tentacles, ink sacs and internal shell (back). Wash out the squid tube, peel off the skin and discard. Cut off the wings. Pound coriander roots and garlic finely. Mix with cooked rice, water chestnuts, carrot and seasoning. Fill the squid tube with the mixture. Make a small incision at the point of the tube to expel any air and fill up to about three quarters full. The stuffing will expand as it cooks. Close the opening with a wooden toothpick. Steam the squid tubes for two minutes or until just cooked. 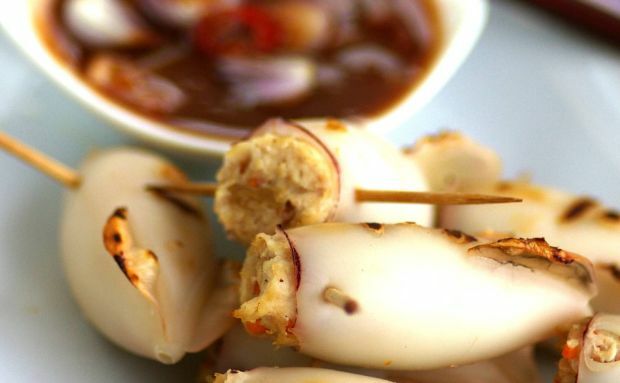 Place the squid tubes on a grill pan and grill for three minutes. Remove and serve with the dipping sauce.